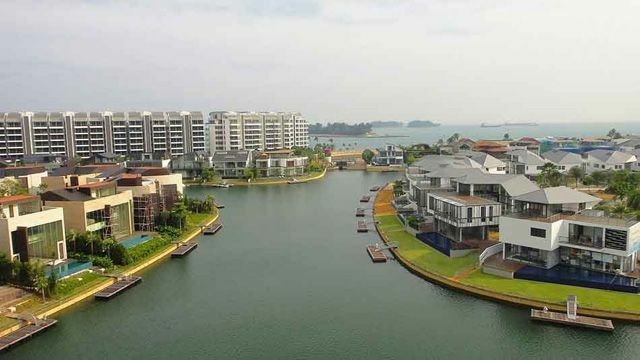 After seeing a slump in prices for 3 years, the property market in Sentosa Cove has been buoyant recently, especially in properties which are being put for auctions. In fact, bargain deals in Sentosa Cove have been lurking since 2016. And for this month’s list, 2 owners’ listings are up for auction, together with 1 mortgagee sale. The single mortgagee sale this month is a 2-bedroom apartment (1,227 sqft) at W Residences Singapore – a luxurious 288-unit condominium which was completed back in 2012 by City Developments Ltd (CDL). The project is also part of the Quayside Collection, which includes the Quayside Isle retail and F&B podium, together with W Hotel Singapore. The subject 2-bedoom unit is located on the 5th floor at W Residences and it’s said to possess a view of ONE°15 Marina Club. The indicative selling price will be at approximately S$2.53 million (or S$2,062 psf) – which is a price reduction of around S$1 million from the initial purchase price back in 2010 – for S$3.55 million (or S$2,891 psf). According to transaction data from the Urban Redevelopment Authority (URA), this was one of the total 25 units sold by CDL between Apr 2010 to Oct 2014 – at an average psf of S$2,736. Another property on the auction list is a 3-bedroom (1,894 sqft) at The Oceanfront condo (also developed by CDL) – a 264-unit residential project completed back in 2010, offering most residents full views of the marina and sea. Sitting on the 8th floor at one of its 15-storey residential blocks, the unit was put up at an opening bid price of S$2.65 million (or $1,399 psf). However, there weren’t any bids received and the property was eventually withdrawn. Based on the opening bid price, it’s approximately 20% lower than the original purchase price of S$3.3 million or S$1,742 psf back in Jan 2010. The latest transaction done earlier in May 2017 at The Oceanfront was also for 3-bedder (1,711 sqft) – slightly smaller unit than the subject unit. It was sold for S$2.85 million or S$1,665 psf, which was at a profit from owner’s purchase price of S$2.77 million (or $1,618 psf) in May 2007. The last unit on the auction list is a 3-bedder (2,131) at The Berth by the Cove with an indicative price tag of S$2.55 million (or S$1,197 psf). The owner acquired the unit back in 2005 at only S$1.6 million or S$758 psf when it was a new launch condo project. Back then, the median psf for The Berth by the Cove was only around S$830 psf. Based on caveats, another 3-bedroom unit (1,658 sqft) at The Berth by the Cove was sold at a much higher psf price – for S$1,327 psf (or S$2.2 million) in Mar 2017. In the first 5 months of 2017, 21 units have changed hands in total – 15 condominium units and 6 bungalows. It reflects a 75% year-on-year increase in the number of transactions in Sentosa Cove when compared to the first 5 months in 2016.